Only this week someone in my family asked me how to do this. This explanation is certainly better than mine. If you haven't joined Twitter yet this Australian Guide from members of The Australian Library and Information Association will show you the way. No joke: get Nero 9 for free! Writing to newspapers in your ancestors' home towns may help you. Wonder if this lady wil get any replies! Just over two weeks ago I scored a Google Wave invitation from a young friend - thanks George. I can see enormous potential for this new tool especially when some of the features that are highlighted in the Wave explanatory video, but are not yet activated, are implemented. I am, however, a frustrated waver. I have joined waves for educators, librarians, Australian educators, Sydneysiders, women on the wave and genealogists. "Predictably Librarians across world already self organized themselves brilliantly on Google Wave - likewise Educationalists & Genealogists." The Librarians Wave Directory that I have joined is very well organised and the most active Wave I am on. The Educators Wave Directory started off with a flourish but there hasn't been a post since 22 October. Surprisingly the Aussie Wavers Wave for Australian educators is very quiet. The participants on this Wave are among the leaders in the integration of IT into education in Australia. The Sydney (Australia) Users Wave has over 450 posts and is updated almost daily. The WOW - Women on the Wave group is a good directory for a minority group with Wave invitations. Having retired from IT, Education and Libraries I am mostly interested in Genealogy Waves. I have used Twitter, Facebook, this blog and GenealogyWise to find other genealogists on Google Wave. I have managed to score Waves invites for a number of people who have contacted me. The first Wave I joined "Hi" showed promise - the participants are an international group of persons who actively use social media to enhance their hobby; there has been no activity on this list since October 25. Tamura Jones started a most informative and successful private Genealogy Wave that contains a directory of Genealogists using Wave, links to other genealogy waves and resources about genealogy wave. Whenever I find a genealogist with a wave account I add them to Tamura's wave that is growing to be a fine resource. The Public Genealogy Wave (Here is a public wave for any Wavers obsessed with Genealogy to discuss using G-Wave with Genealogy - or just to discuss Genealogy in general) is also shaping up to be a meeting place for genealogists around the world. My frustration with this Australian Genealogy Wave is that, at this early stage of the Google Wave rollout, there are too few genealogists with access to the Wave for this Wave with only eight members to be effective. I am pleased, however, with the structure of the Wave and can see it in the future as a valuable resource for genealogists in Australia. Now that I have eight Google Wave invitations to give out I hope to find more genealogists to join me there. Our National Anthem reminds us that Australia "is girt by sea"; it is a big island not reachable by land from any other country. As my ancestors were not able to walk on water they had to make the perilous journey to the land downunder by sea. Unfortunately a number of them had no say in the matter as they were banished to Australia for a range of petty crimes and the remainder came to escape poverty in Ireland. As all of my ancestors had arrived in Australia by 1877 there are no photographic records of their journeys. I am therefore offering, as my contribution to "Smile for the Camera, 18th Edition - Travel" some pictures found on the internet of those ships on which my ancestors made the arduous journey to Australia. I cannot find immigration details for some of my other ancestors but I presume they didn't swim. Unfortunately I cannot find pictures of the ships that brought the following ancestors to Australia in the 1800s. I will keep searching. This post was prepared for the Genealogy Carnival: Smile for the Camera, 18th Edition"Travel"
This cruise starts and ends in our home town, Sydney, - hope that I can make it. To forget one's ancestors is to be a brook without a source,a tree without a root. Adhering to copyright can be a pain in the ****. CAL (Copyright Agency Limited) has a list of FAQs on their website that might provide answers for Australian Genealogists. It must be remembered that this agency represents Australian copyright owners so the answers/advice may show that bias. Thanks to Rosemary Kopittke for alerting us on Twitter to this resource, Welsh crime and punishment database 1730-1830. 365 days ago I was sitting in bed recovering from surgery and contemplating my approaching retirement. I knew that, in retirement, I was going to devote more time to discovering and organising my family's history. I had also blogged about my work for a couple of years.Although there a number of Genealogy blogs around these appeared to have a US, international, commercial or family bias. With the exception of Genealogy in New South Wales I couldn't find anything distinctly Australian. Twelve months ago Twitter had not yet taken off as a way to disseminate news about genealogy in Australia. As I have a hunger for news I was subscribed to a number of RSS feeds from the fields of technology, genealogy, education and libraries. 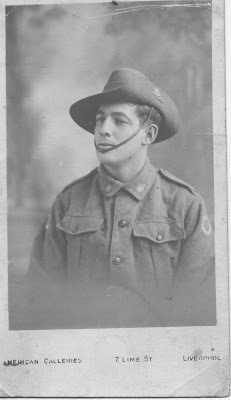 I thought that perhaps I should create a a genealogy blog with an Australian bias by an amateur Australian genealogist. Geniaus the blog was born. Why add yet another blog to the crowded blogosphere? I thought I would like a place to share progress, reflections and resources as I solve my genealogical jigsaw so here goes - another blog is born. I've been researching the family on and off for the last 20 years and, with retirement looming, hope to finally get organised and solve some of my mysteries. Twelve months down the track it is time for reflection. My blog has evolved to become more of a resource sharing tool and a presence for Geniaus on the web. I have not blogged about every little bit of progress I have made as I don't really think that the genealogy community at large is interested in the minutiae of my research. Taking part in Genealogy Carnivals has given me an opportunity to tell some stories about my family. I have tended to blog about my big news eg my new family website http://www.geniaus.net and about the tools I use. The blog allows me space to share my latest links from Delicious and my latest posts on Twitter. On a personal level the blog has has documented my journey as I learn about my family, genealogy and appropriate tools to use. For this purpose alone it has been a worthwhile exercise. A perusal of the Google Analytics for my site shows that I do not have a huge audience but there are a number of people who follow the blog. Around 1400 people have visited the blog 2500 times and looked at around 4000 pages. During the year people from 49 countries have visited the blog, around half of these visitors are from Australia. Initially the visitors were mostly from the US but over the year this has shifted so that, now most of the readers are from 26 cities in Australia, with Sydney having the most representation. 18.06%of the visits are from direct traffic, 59.98% are from referring sites such as Google , Blogger and other websites and 21.96% come via search engines. So quite a few people just happen across the site. It is interesting to note that the posts for Genealogy Carnivals attract a large number of hits. Will the Geniaus blog be around to celebrate a second birthday? I think it will. Without access to a reliable crystal ball I cannot make an accurate prediction. As new tools such as Google Wave and who-knows-what-else appear and enter the mainstream this blog might outlive its usefulness and my minds meanderings may move to a new more exciting and innovative platform. Today I had a query from another Australian Genealogist asking me about the web-hosting service I use for my family site http://www.geniaus.net. I realise that it is now nearly four months since I uploaded my first Gedcom to the site. I am pleased to report that I am still delighted with the software I chose for the site, TNG (The Next Generation of Genealogy Software) and the hosting company they recommended, Simply Hosting. I outlined the reasons for my choices in an earlier blog post. I wondered whether I should make the site private or should I open it up to the world and share the fruits of my labour. I opted for the sharing path and am pleased to have done so. By publishing my work I have had contact from a number of distant cousins who have happened across the site as they searched the internet for their ancestors. These people have been able to add details to my tree and act as editors for my site. Sharing my data has made me realise that some of my referencing in the early days left a lot to be desired so the web presence has embarrassed me into going over my data and seeking and tidying up my sources. Although my database of around 7,000 has not grown substantially the amount of referencing and checking I have done in the past four months has hopefully improved the quality of my data. The collaborative nature of the TNG platform has enabed me to give varying levels of access to those kin who have contacted me. I can allow downloads of gedcom files, editing of data and access to details of living relatives. It takes less than five minutes to reload a new gedcom to the site so I am able to update it painlessly whenever I have made changes. Maintenance is a breeze. Uploading of photos and documents is easy, the face tagging feature for photos is fantastic. A basic knowledge of html is useful to personalise the templates provided by TNG but patience and perseverance are the major traits needed to accomplish this task. Although I would like to make formatting changes to the whole site I am hastening slowly. I am thrilled by my choice of software and would recommend it to any family historians who want a presence on the web where they can easily collaborate with cousins. Bah, Humbug to those who criticise users of social networking. It's time to get with it. A seminar dedicated to the long-term care of documents, family photographs, letters and diaries. The emphasis will be on archival storage, with tips on which materials to use and where to find them. Participants are welcome to bring one or two items of family memorabilia to discuss their care with State Library conservators. John recently posted More Maps for my Collection on his blog The Wandering Genealogist. John had managed to purchase from Oxfam, an opshop in the UK, some historical maps for a small fee. As a reader I am a good customer of our local Vinnies store where I regularly purchase preloved books to feed my reading habit. John's post got me thinking about opshops as places where I might find maps and books relevant to my family research. I will now cast my net wider, pop into more opshops and browse for more then just recreational reading. The Australian OpShop Listing Site will help me find more places to search. Have just joined this free site - looks promising. Free Irish Ancestor Records: "This site is aimed at those people who are interested in Irish Family History. There is a free search of one million records from Griffiths Valuation, which is available once you have taken a free membership. With Discussion Forums and links for each County it is well worth having a good look at.